We were relieved to see our dear friend Linda waiting for us at the airport exit, and she quickly rescued us from the over-eager airport porters insistent on carrying our luggage and finding us transport into town. Linda had arrived in Bali weeks earlier, and had been working on research for a series of films that would document Balinese life rituals. She had already organized two minivans to take us and our luggage from Denpasar airport to Ubud, where we were to be staying. 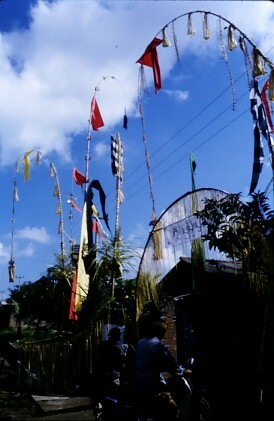 On the way we passed by a house where brightly colored flags were flying atop tall poles. Clearly some kind of ceremony was going on. We asked the drivers to stop and jumped out to take a look. We could hardly believe that we were barely off the plane and stumbling across a real Balinese ritual going on. Nobody seemed to mind us having a discrete peek - they seemed to be making preparations for an Odalan - a purification ceremony for the family temple that stands within the walls of their compound. These ceremonies must be held about once a year to purify the temple and the family compound, and keep it free from evil forces. 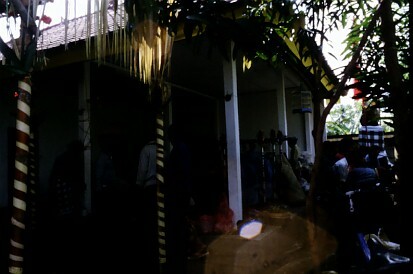 The families spend huge sums on these ceremonies - the priest, gamelan, and the feast to feed all the guests. 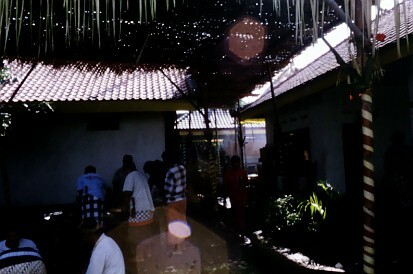 We finally arrived in Ubud and were taken to the place that would be our home for the next three weeks - Oka Wati's. Despite being located in the heart of Ubud, Oka Wati's is set back from the main street, the busy Monkey Forest Road, and looks out over a set of rice fields. Our room was upstairs, so we were able to watch the rice farmer each day. Apparently it had been raining quite a lot just before we arrived, and the place smelled lush and fertile. 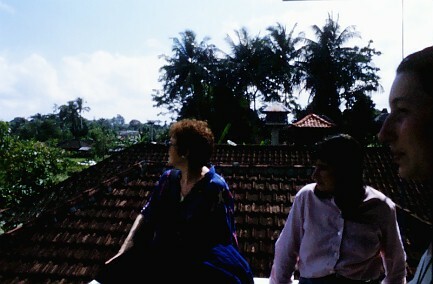 This picture shows (left to right) Linda, Astrid, and Justine, on our balcony, feeling very lucky to be all together in Bali. 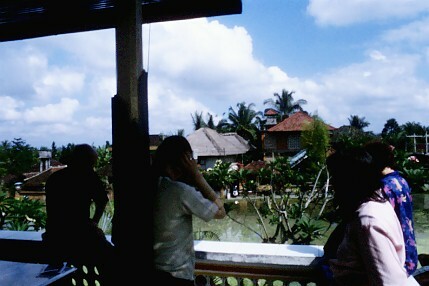 This is another view looking out from our balcony over the rice field. From left to right, Steve, Dan, Astrid, and Linda. On the far side of the rice field is the little office for the hotel, and other buildings belonging to the village of Ubud.